UC Berkeley students and other community members took part in a national Day of Action Thursday that garnered significantly less participation than the large-scale Occupy Cal protests of last November. The day’s protest in support of public education began with small campus demonstrations and culminated in a march through Oakland. Over the course of the day, demonstrators marched down Telegraph Avenue, rallied at Frank Ogawa Plaza and protested in front of the UC Office of the President, among other actions. Later in the day, a small group began a journey to Sacramento in advance of the upcoming March 5 protest there. By 8:30 a.m., protesters had wrapped caution tape around the perimeter of California Hall — which houses Chancellor Robert Birgeneau’s office — and about 20 protesters gathered outside the building in the rain. 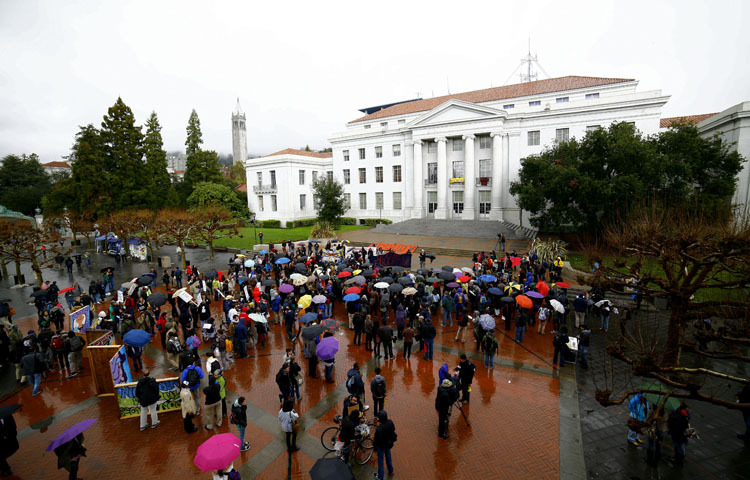 Protesters then shifted their attention to Sproul Plaza, where they convened in small groups and prepared for a noon rally. Fewer than 200 students and supporters assembled on the plaza for the rally. There, various students and organizers — including protesters from Occupy Stanford — spoke to the crowd. After the rally, a mix of union members, students and other protesters marched down Telegraph Avenue toward Oakland, eventually arriving at Frank Ogawa Plaza, which protesters commonly refer to as Oscar Grant Plaza. About 100 protesters marched down Telegraph, using a speaker system mounted on a wheelchair to amplify music and chants. Protesters’ chants included criticism of Gov. Jerry Brown, the financial system and cuts to education. Protesters then marched down San Pablo Avenue but soon split ways as one group began to head toward Sacramento, while the remaining protesters walked to Morgan Stanley’s Oakland offices, where they surrounded the main entrance of the building and unsuccessfully demanded to speak with a representative of the firm. The protesters soon moved on to the UC Office of the President, where they were met by about 15 police officers. Protesters expressed desire to avoid confrontation with the police and turned around. After returning to Frank Ogawa Plaza for a brief meeting, protesters dispersed at about 5 p.m.
Thursday’s relatively small protest stood in contrast to the large Occupy Cal demonstrations last November, which drew thousands to Sproul Plaza and resulted in police use of force against protesters. Still, a small contingent of demonstrators is embarking on a “99 Mile March for Education and Social Justice” to the state Capitol in Sacramento, where thousands of students from around the state are expected to converge on Monday. Staff writers Afsana Afzal, Sara Khan and Amruta Trivedi contributed to this report.